Cabela's Adventure Camp includes fast paced, exciting outdoor activities that send you straight to summer camp, even in the middle of winter! Players will lose themselves and forget they aren't outdoors as they compete in summer time activities such: Thrill Hill Biking, Wild River Kayaking, Full Throttle Wave Riding and more. Interactive griefing allows idle players to grief others by knocking down trees and rocks creating in game obstacles that will add hilarious shenanigans to the mix. The brisk gameplay and fantastic variety keep everyone animated, excited and having fun! 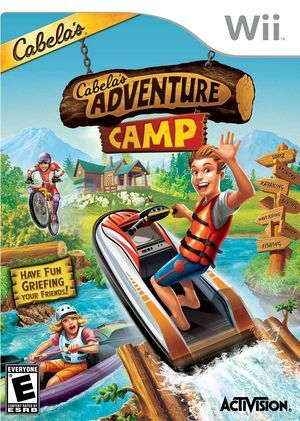 The graph below charts the compatibility with Cabela's Adventure Camp since Dolphin's 2.0 release, listing revisions only where a compatibility change occurred. This page was last edited on 18 October 2017, at 10:05.